Survey results reveal that providers lack access to the level of information necessary to facilitate clinically appropriate referrals within their networks. Among those who refer out of network, 45 percent say that it’s difficult to determine who is in the network and, on average, they estimate that one-third of out-of-network referrals would be avoidable with more robust information about in-network colleagues. Findings show that scheduling limitations also contribute to patient retention issues – 42 percent of patients leave a provider’s office without a necessary referral appointment booked, despite over 60 percent of providers considering point-of-service scheduling extremely or very important. 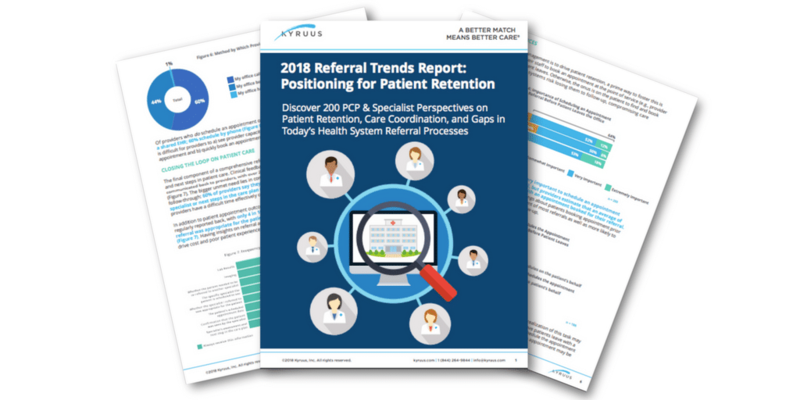 72 percent of providers say they or their staff usually refer to the same provider for a given specialty, indicating potential missed opportunities to connect patients with a different provider with more specific expertise and/or earlier availability. 42 percent of providers feel they are not practicing at the top of their license all or most of the time, which can hinder professional satisfaction and contribute to disengagement. Only 40 percent of providers report always knowing whether or not their referral was appropriate for the patient or whether the patient needed to be re-referred, hindering care coordination. Wakefield Research conducted this online survey on behalf of Kyruus. All participants are affiliated with a hospital or health system, accept insurance, have been in practice for a year or more, and spend at least 20 hours per week seeing patients. To learn more, download the free research report.